This post may be continued later tonight because there’s a meteor shower a-coming! Purchased! I toured myself silly and got 100 medals for the Southern Island Wallpaper. It’s very relaxing. 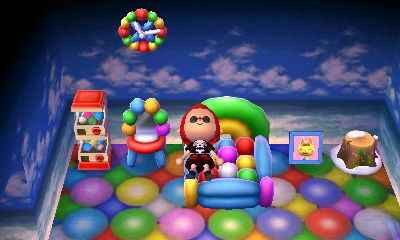 Now I just need more beach-themed items. I think I want a room with Pirate stuff from Pascal, Fishing tourney stuff (like the football fish lamp), mermaid stuff, and island stuff. I’m gonna have to get busy to make my watery house. Speaking of fishing tournaments, there’s one this Saturday. I don’t know the details, but I sure hope I do better than I did on the last one. 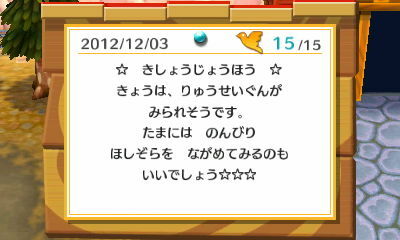 Maikochan sent me another lovely letter thanking me for escorting her to Jisuna village. Unfortunately I think that she thinks the toy cameras are disposable because I got my third one. I’d say I have to take her somewhere else to get a different present, but she also sent me that globe once. 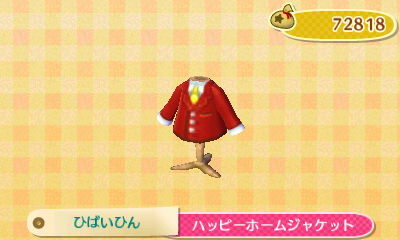 To congratulate me for getting over 30,000 points, the happy home academy sent me a letter containing a happy home jacket. Now if I had some respectable pants I could look like Lyle. It can’t be purchased from the catalog. 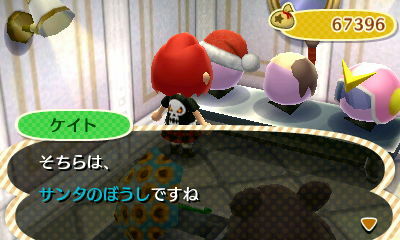 I deposited a lot of bells yesterday. I could pay off my loan. 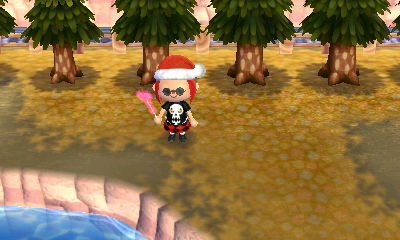 Or I could put something new in town, but I’m sitting on my 666k for the moment. 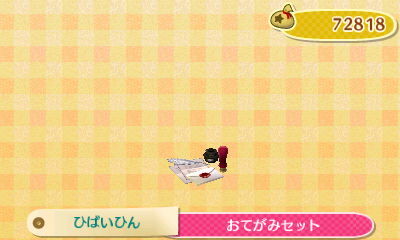 In commemoration of my having saved over 500,000 bells the post office sent me a letter containing a letter set. 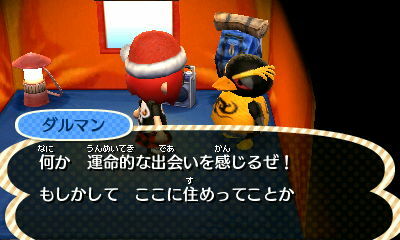 Even poison frog was mentioning Jingle. Dare I say I want snow on the ground to get in the mood? I live in California. I can want snow in a game. 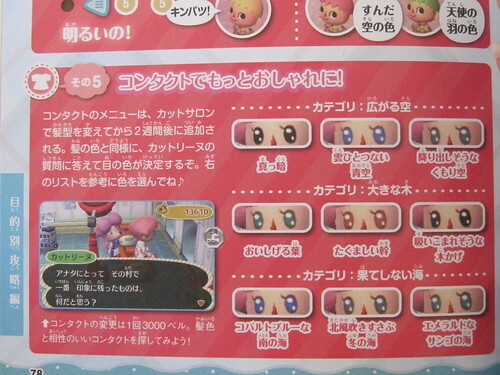 I remember having to pay an ungodly amount of bells to get a snowglobe in City Folk. 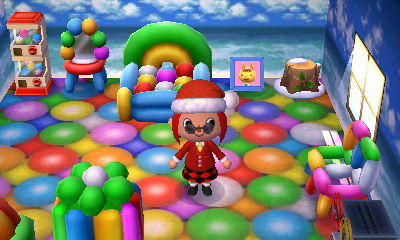 Nook also had the festive wallpaper which I purchased to further my holiday decorating. Here are a few pictures (during the day) of the light sticks you can buy from Nook Brothers. I’ll try to remember to take them out and maybe even use one during tonight’s meteor shower. I think I have a blue one stashed in a drawer as well. Hopper aka ダルマン camped in Kasen last night. I talked to him a few times and he wanted to move in. I almost said yes. But then I didn’t. I’d rather have someone move out first. 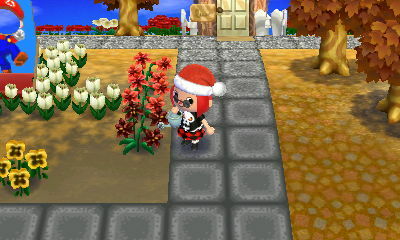 I got a black lily today. My second lily hybrid. I still haven’t gotten any violet hybrids. Shinobu was in the café getting a morning pick-me-up this morning. I knew I liked her. 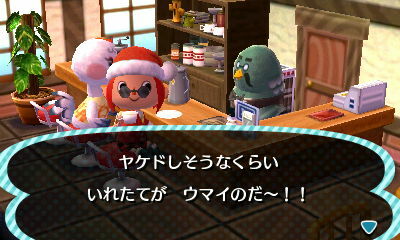 Brewster still didn’t say much, just told me to sit in the empty seat and then got busy making my coffee. This one’s harder to translate. Something about burning and delicious. LOL. I think the second line is that it’s delicious and handmade, but umai can be either delicious or skillful, so it could be skillfully made by hand…shrug. 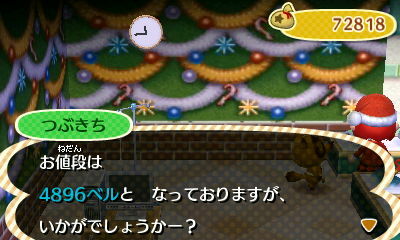 I decided to go to town hall and ask Shizue how the town environment was. I haven’t mapped anything out for perfect town. I’ve just been putting flowers willy nilly and planting a few trees here and there. 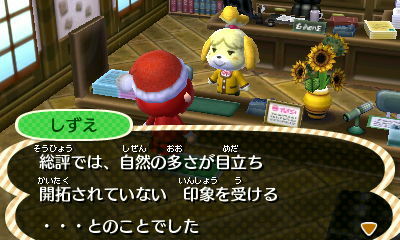 Usually she just says the town is 「まあまあ」 which means so so. But today she said it was getting better. Hooray for a step in the right direction! Then she mentioned weeds and garbage. I don’t have any weeds (that I know of) but I do have a pile of junk in front of the train station for free (and not many takers for it) so I rounded all of that up, put it in my storage for a later date, sold some old clothes to make room, and then went and talked to Shizue again. She gave me the same first part that it was getting better, but the rest changed. I’m still trying to investigate what I need to do. This mentions something about development. And even after looking at JP wikis and blogs I’m confused. Maybe I need to add a couple more public works Items? I mentioned contacts and not knowing how to get them yesterday? Well I sat down and read the page where they’re pictured Instead of just looking at the pictures which is my usual magazine perusal). It looks like the salon will offer them after it’s been open for two weeks. So, looks like I won’t be green-eyed for a little while. Looks like I may be touching my nest egg and building some new things after all. I’ll be back later with meteor shower pics. 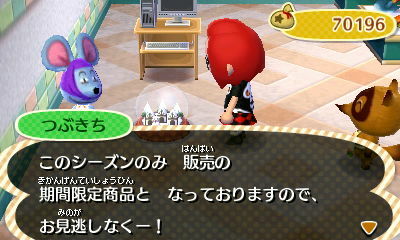 This entry was posted in Animal Crossing, Video Games and tagged Animal Crossing, とびだせ, どうぶつの森, new leaf by Jennifer. Bookmark the permalink.